If you've ever had liquids or gels leaking into your suitcase, you might be interested in PKOH NYC's Silicone Travel Bottles. 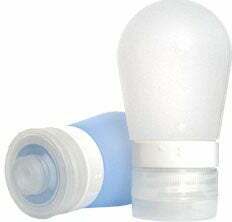 Just the right size to sneak under that Homeland Security size limit for deadly liquids, these bulb-shaped containers seal up with a leakproof O-ring. We're liking their wide mouths, just right for a couple of quick 2-ounce shots of Jack during a mesmerizing coast-to-coast flight. A two-pack of these translucent bottles—one blue and one white—will run you 20 bucks.